Appearance: Pours a deep red amber. Tight one finger off-white head that receeds quickly leaving very little lacing. Smell: Mmm. Big scent of buttery sweet caramel, hazelnuts and butterscotch. There is a little bit of hops on the back end but the main smells are sweet. Almost smells a bit like ice cream with nuts and caramel topping. Yes…that good. Initial Taste: Not as sweet as the smell but just as enjoyable. Soft malt sweetness with a hoppy bite and a nice buttery mouthfeel that makes this a spicier beer than anticipated. The strong hop infusion gives this beer a bitter but clean aftertaste. Thoughts: Another good Winter beer. This is by far my favorite beer season. The beers are spicy, warming and full bodied. 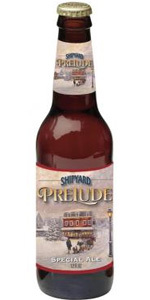 Prelude by Shipyard delivers to us a perfect example of winter seasonal brews. This beer has an awesome smell and the taste is warming and spicy with a little sweetness and nice buttery mouthfeel. I like this beer but it’s not one of my go-to winter selections. There is just a little too much bite in the aftertaste for this to be on the top of my list. But overall it’s a great representation of the style. Just had this again a year later and I have to say this has become one of my favorite winter warmers. My tastes have become more refined in the past year and as such this beer takes on a whole new flavor profile for me. The butterscotch malty goodness is balanced to near perfection with a leafy earth-like hop presence. It’s like dessert and dinner mixed into one beer. The perfect beer for those cold New England winters. I highly recommend.